by José López from Costa Rica. This is the evil ring from Lord of the Rings movies. 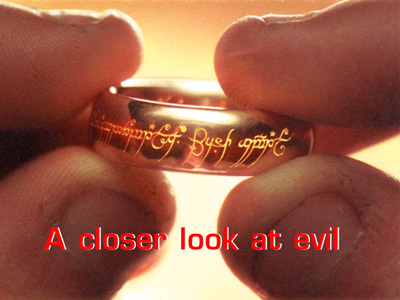 If you don't know the story, it's believed that the one that owns the ring will get great power but it's an evil power. The ring engraving says: "One Ring to rule them all, One Ring to find them, One Ring to bring them all and in the darkness bind them." Bush's name has been added to this engraving.